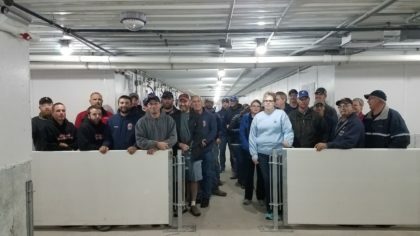 On October 25th, Christensen Farm’s (“CF”) Asset Department offered a meal and tour of the almost completed sow farm, LDC, to members of the first responder groups in the Atkinson, NE and Spencer, NE area. Extremely well received by the nearly 50 responders, this was a great opportunity for CF to showcase its continuous commitment to innovation and the safety of its people, animals and facilities. The Asset and Safety Departments have committed to stay in contact with this group over the next few months to strengthen the relationship and update CF’s emergency response protocol for both farms located in this area. There was zero disagreement from all parties at this event on the constant opportunity to prepare in the case of an emergency for the overall safety of all. The members of the Asset Team extend a big “thank-you” to all who attended and it was great meet all those who volunteer their time for the safety of CF’s people and communities. 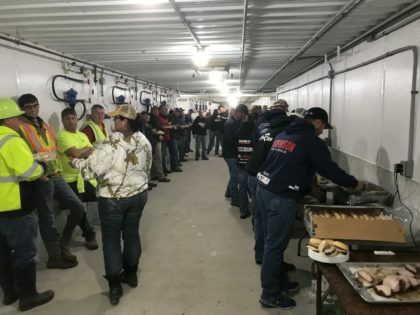 A meal was also provided for all the contractors and their employees working on the build of this farm as a small token of appreciation for their hard work and a job well done. It takes a team effort to have success on a project like this and everyone involved is an important part of its success. LDC contractors enjoying a meal. Members of the local first responder groups. CF broke ground for the new LDC project on May 10th. Incorporating elements of innovation and technology, the facility is all positive pressure ventilation and completely filtered. New to CF’s production system and being used in the gestation barn is the Gestal feeding system for our group housing. This system uses RFID (radio-frequency identification) ear tags which will allow sows to be fed individually according to body condition and nutritional needs in a group housing setting. The computer network system will allow production management to monitor daily feeding of each individual sow.